I have purchased several of Kesra’s paintings and love each one. I was first drawn to them, because they depicted nature in such an inspiring way. I have used them to add a sense of warmth and peace to my new home in Maryland. I placed one of a lovely tree with multishades of green and shadows in my living room to add to the four seasons idea I had going on there. Later, I purchased a Colorado plateau painting, which was a constant reminder of the high desert terrain which our family had grown to love living in the west. Soon I added a snowy mountain scene of Scotland. I loved the brooding sense it brought to one of my bedrooms. Other paintings have included a view through an olive grove, two pebble paintings and a wonderful snowy field painting with a lone tree. The olive grove one is located in my office, where I spend much of my working time, and is a constant reminder of serenity and order. The pebbles delight with a sense of many colors, each stone being a tiny work of art. I have also purchased a few of Kesra’s acrylics. A weeping willow acrylic speaks to me of my childhood, and a shaded river reminds me of how an evening by a stream can lift ones heart. My partner and I own several of Kesra’s paintings; in fact, I think we have at least one in each of the major rooms of our home. While some of the ones we own are very bright and colorful and others more blue and grey, in each case I was attracted to the scene because of how inviting and authentic I find Kesra’s depiction of nature. Much of my childhood was spent out of doors, in all seasons and during all times of the day and night, and I found much solitude and peace there, no matter the conditions or weather. I was rarely still, always venturing, even over terrain I knew well. Kesra’s paintings, much like nature itself, draw me in, and inspire curiosity about what is just beyond that bend in the path or over that distant hillside. Further, the motion, interplay of shadows and light, and depth of her work remind me of the full sensory experience of nature. I prefer my interior spaces more and more these days, but Kesra’s art reminds me of what I am choosing to miss, and occasionally motivates me to go find it again! I had seen and admired Kesra’s work for many years at Van Gilder Pottery and Studio, never imagining I should buy one for myself. Eventually, it dawned on me “I want one.” So I contacted Kesra and selected one that I had to have. Now, a few years later, I have three of Kesra’s paintings in my collection. 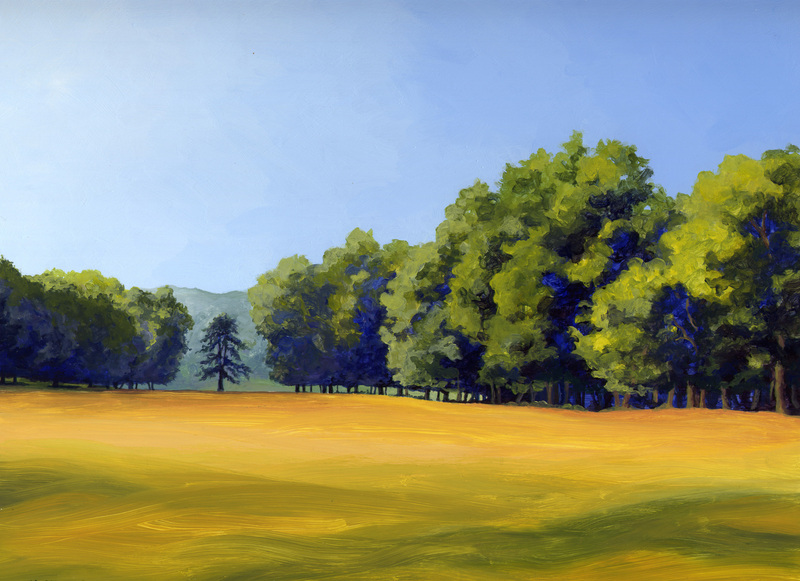 I am drawn to her paintings of landscapes with blue skies, water and her trees. I am so very fond of her work. The landscape colors compliment my living and family rooms, and I truly enjoy looking at them every day. Kesra, your art is poetry on canvas. Each one tells a different story. I love the moods you depict, the colors, contours, textures. Your paintings make me think of Edward Hopper if he were happy. I love how your trees make me feel. Your paintings are like Ansel Adams photography, but with color and paint! That painting makes my eyes happy!